UFC had a big match in Chicago on Saturday. If you went to the United Center or out to a bar to watch the fights, you and I spent our nights a little differently. I went to a bar that had I, Robot on its one TV and ate a Tomato Grinder that had a little too much arugula on it. 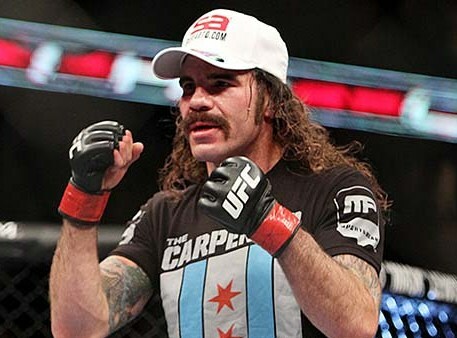 I may have missed the fights, but it was hard to miss the mustache on Clay Guida. Clay fought Hatsu Hioki and won in a split decision. If looks could kill, Guida would have won at the opening bell, or whatever they do to signify the beginning of the fight. This entry was posted in Sports Steesh and tagged celebrities, Celebrity, celebrity mustache, clay guida, entertainment, fighting, Humor, I Robot, Moustache, mustache, mustaches, sports, UFC, ultimate fighting on January 28, 2013 by Los Bulls. Clay was scary enough without the mustache :).